"Just telling me something is 'forbidden' just makes me want to know even more about it." Personality: He places the pursuit of knowledge above most other things, curious, intelligent, sarcastic, rebellious, isn't easily angered unlesss you get in the way of his research or damage on of his books/research tools, being told no about something makes him want to do/know about it even more, comes across as cold and heartless although he’s simply not very good at showing affection. A mage residing in the Greada Forest. He constantly seeks out knowledge and new magics. He knows many spells that would be considered forbidden by the law, but he could care less and simply takes care that he's not seen using it publicly. After aiding a friend who was attacked by a foreign dragon, Ffaralder stopped that dragon, Valsparra, before damage could be done. 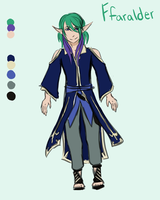 Valsparra is forced into servitude due to his crime and must now serve Ffaralder for one year. Ffaralder takes advantage of the convenience of having a servant deal with his necessities and delves into his magic research. 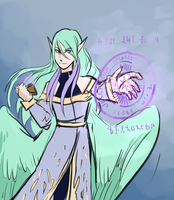 "By all reality I should be dead, but here I am, and I can only go foward from this point on"
After being attacked by a monster while traveling and receiving a fatal injury, Ffaralder casts a truly forbidden spell to defeat the monster since he was probably going to die anyways. He was able to defeat the monster and protect Valsparra and Beeilen. After the dust settled, Ffaralder's body was nowhere to be found. He was assumed dead, but some months later he reappeared. 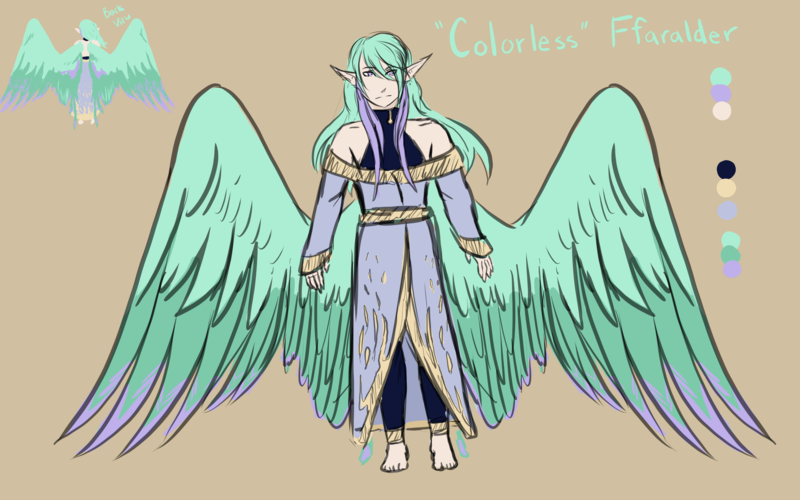 His appearance was different, and he decided to call his new appearance "colorless" because of the paler colors. He doesn't know what caused him to take this appearance. At times he is very much like is original self, but at other times he is like a doll, completely unable to move. His mind is very hazy, so Ffaralder has little control of when the haze will clear, and he can control his own body. When he is himself, he focusses on trying to learn what exactly happened to him as he was surely meant to die that day, but instead awoke in this appearance. His other goal is to learn how to control the haze, since this body has much more magic then his original, it would be very convenient for continuing his research. He does become romantically involved with Valsparra, but not until after Ffaralder became colorless. no romantic interactions between Valsparra and normal/phoenix Ffaralder. 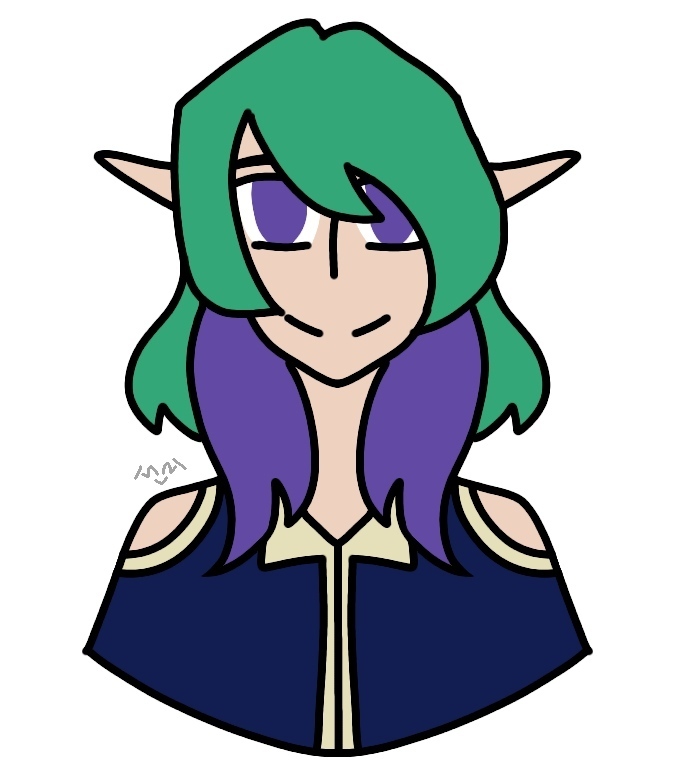 -Feel free to draw him with any of the characters in links, any of my characters, or even with your ocs if you have an idea. Magic, he knows a lot of spells of various elements. As a forest being, his nature magic (plant manipulation) is most powerful. He can cast related elements (Light, Earth, Wind, water) using his body as a conduit. For opposing elements (like dark, fire, lightning, ice, etc.) he has to use either a grimoire or magic item to cast. He keeps small grimoires that he's handwritten in a small satchel that he keeps on his person when he goes out. They have all the spells he finds most useful of the opposing elements. Basic and moderate level spells can be cast repeatedly from a grimoire, although due to the level of magic needed to used advanced or higher level spells, the page will burn gold with magic energy so he has to ripe it out to avoid the entire book from burning. After becoming "Colorless" his spellcasting has improved tremondously and he has more magic at his disposal. He's noticed that he can now cast basic level spells of opposing elements without the need of items or grimoires. 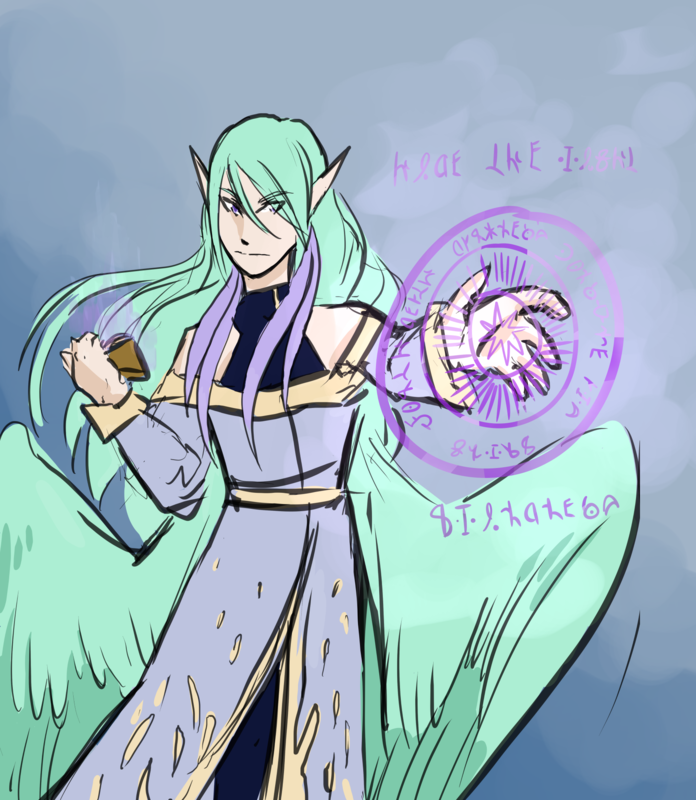 He stills uses a grimoire when he's casting around others, since it shouldn't be possible for someone to cast all elements with just their body as a conduit and he'd like to avoid causing a ruckus. 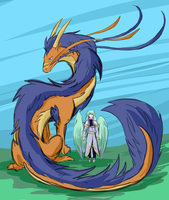 [ ] As a punishment for a crime he commited in the forest of Greada, Valsparra became the servant Ffaralder. Despite being a servant, Ffaralder bearly has Valsparra do anything. 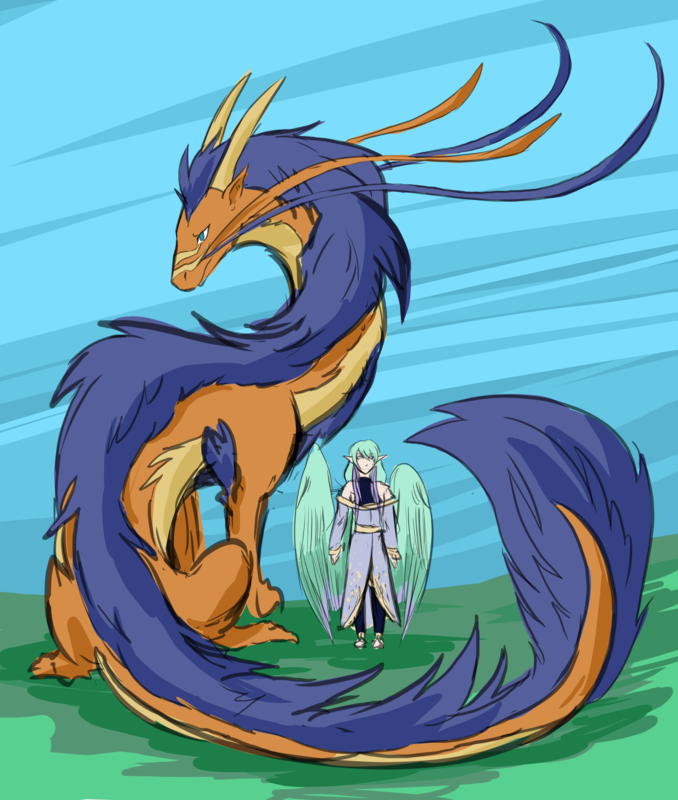 After Valsparra was released from servitude, he stayed with Ffaralder (since Ffaralder indirectly dragged him into a lot of trouble). After Ffaralder "died", but came back as "Colorless", Valsparra helps take care of him when the haze takes over his mind. 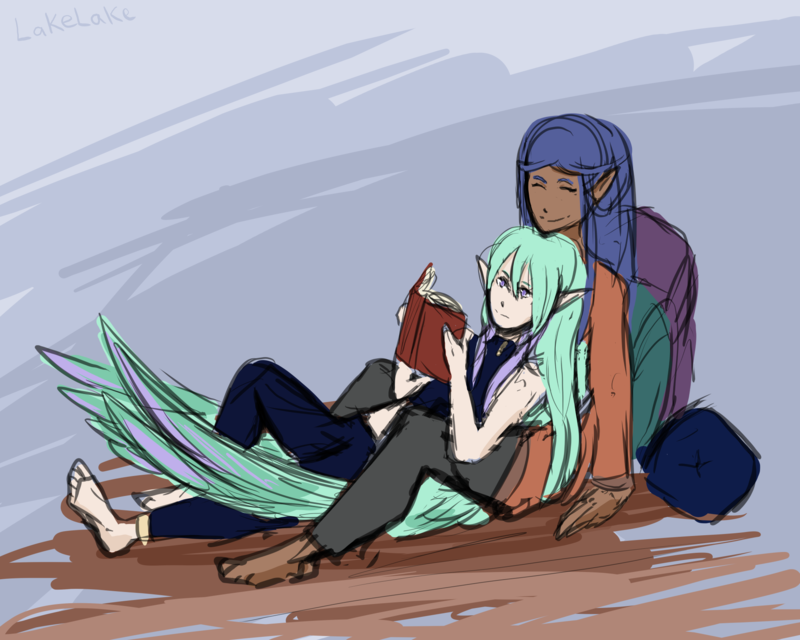 At some point these two develope romantic interest in each other. [ fellow bookworm ] a fellow bookworm and enthusiast for magic, although she has enough common sense to avoid stuff considered as forbidden territory. She winds up joining Ffaralder and Valsparra on a journey. [ friend ] After Ffaralder's parents died, he lived with her family for years until he was able to support himself. She's somewhat like and older sister and enjoys messing with him. [ friend ] Saffa's husband. He's known Ffaralder nearly as long as Saffa has. [ friend ] A water phoenix merchant who met Ffaralder when they were teens. She butts heads with him, and tends to join in with Saffa to mess with him. She sells the grimoires that Ffaralder writes for a good profit.